Your brain is a muscle (or so I’ve been told). Just like your workout routine, if you neglect intellectual pursuits, you won’t see any improvements. 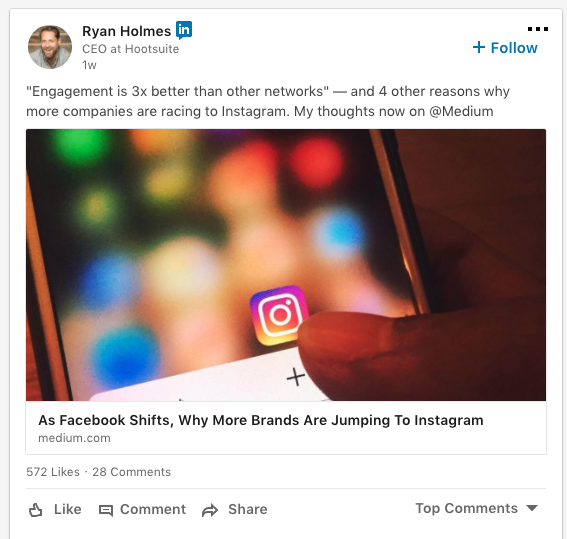 Luckily, with so many influential people and organizations sharing their expertise on social, it’s easy to keep your brain sharp. We’ve created a list of LinkedIn accounts to follow for when you’re on that quest for knowledge. Whether you’re just starting your career or you’re an executive promoting your top talent, Susan Cain has something to teach every one of us. She is the co-founder of the Quiet Revolution and author of the award-winning New York Times bestseller, QUIET: The Power of Introverts in a World That Can’t Stop Talking. Cain gives much-needed credit to the quiet doers of the world and shows how often we overlook and undervalue introverts. Her expertise on the topic has been featured in publications like The Atlantic, New York Times, and the Wall Street Journal. And her Ted Talk has over 18 million views. 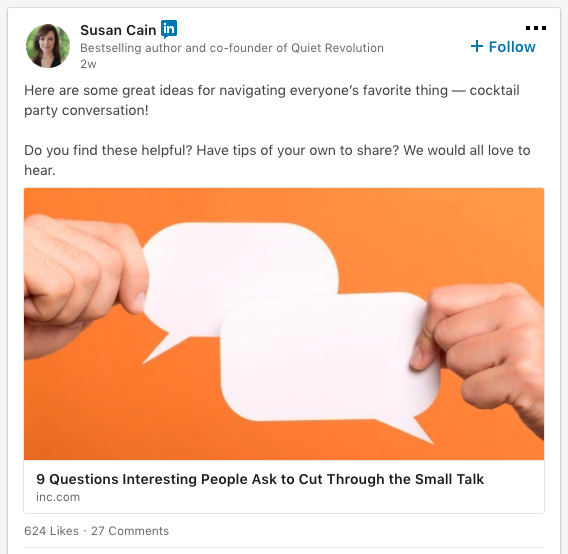 On LinkedIn she regularly shares helpful business advice for introverts. If you’ve ever watched an episode of CBC’s award-winning series Dragon’s Den or The Big Decision, then you’ve probably heard of Arlene Dickinson. She’s one of Canada’s most iconic entrepreneurs and is the author of bestselling books, Persuasion and All In. As you can imagine, this self-made millionaire has a few things to teach us about how to manage money and run a business. Dickinson also shares a monthly digest on LinkedIn with her latest sources of inspiration. Most of us could probably be a little more emotionally tuned in at work, and Dr. Travis Bradberry offers simple ways for us to get there. Bradberry is an expert in emotional intelligence and an award-winning coauthor of the bestseller Emotional Intelligence 2.0. His work has appeared in publications like Newsweek, BusinessWeek, and The Harvard Business Review. 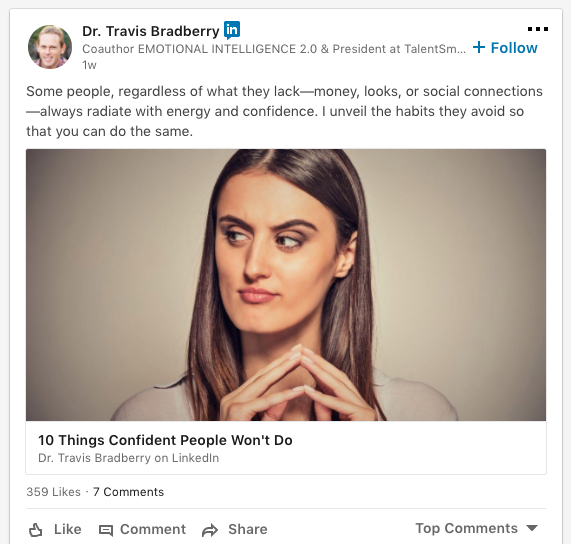 On top of all that, Bradberry regularly writes and shares educational content on LinkedIn that makes emotional intelligence easy to understand and accessible. For example, 10 Things Confident People Won’t Do and 9 Bad Manager Habits That Make People Quit. 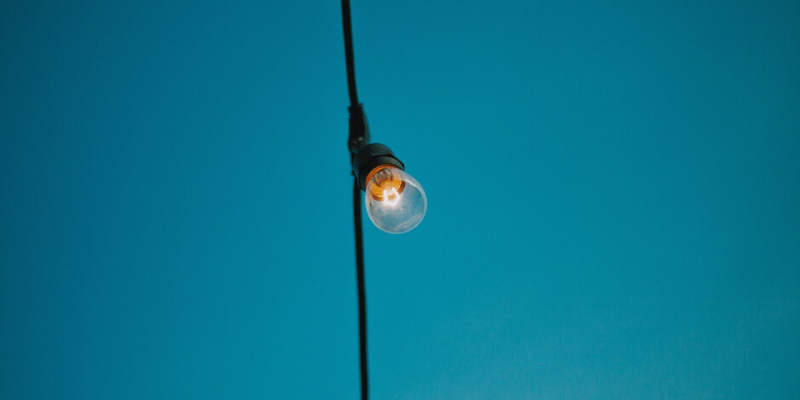 If you’re looking for a quick read and useful tips for navigating tricky situations at work, Bradberry is worth a follow. Wealthsimple is an online investing platform that makes personal finance and investing fun to learn about. Their recurring series, Money Diaries, tells some pretty amazing stories, including interviews with people like Woody Harrelson, Margaret Atwood, and Tegan and Sara. They’ve also started a new series called Smart People Explain Things, where experts break down tricky topics around finance. Follow Wealthsimple if you want investing tips or if you enjoy reading stories from beloved celebrities. Arianna Huffington, CEO of Thrive Global and founder of The Huffington Post, wants to change the way you think about career success. In her latest bestselling books, Thrive and The Sleep Revolution, she talks about the importance of improving mindfulness and wellbeing at work. On LinkedIn she shares lessons about everything from the impact of the internet on our personalities to how to build confidence in a team environment. Kathryn Minshew is the co-author of The New Rules of Work and co-founder and CEO of The Muse, a platform that helps people navigate their careers. She was listed in Forbes’ 30 under 30 in Media and Inc.’s 15 Women to Watch in Tech. 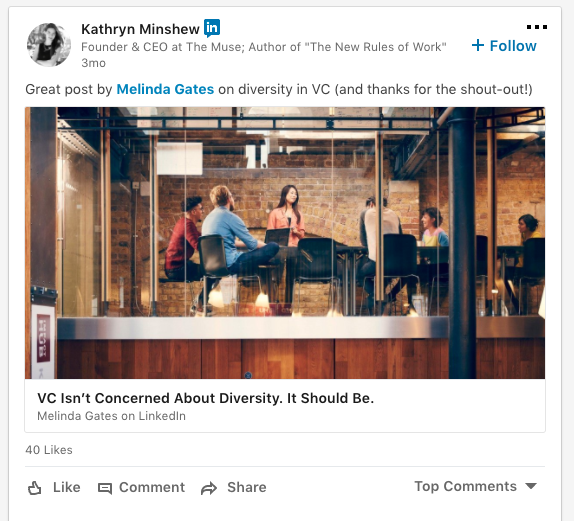 On LinkedIn Minshew shares stories about the changing world of work and advocates for more inclusive, flexible policies so that companies can keep their best talent around longer. SpaceX was founded by Elon Musk with the mission to revolutionize space technology and make it possible for people to live on other planets. With some historic discoveries and expeditions under their belt, it’s no surprise that they were named one of the World’s 50 Most Innovative Companies for 2018 by Fast Company. Follow SpaceX to get news on the latest space technologies. A veteran of the tech world, Bill Gates is an investor, author, philanthropist, and co-founder of Microsoft. Gates has a lot of valuable insights and experiences from his time at Microsoft and ongoing work for the Bill and Melinda Gates Foundation. Whether he’s having a chat with Steven Pinker about human happiness or sharing breakthrough research in the clean energy sector, his educational posts on LinkedIn cater to a range of interests. On LinkedIn they share company updates and technological advances, like their new MRI machine, and often invite their LinkedIn followers to join discussions on discoveries in the field. Ryan Holmes is the CEO of Hootsuite and author of the Amazon-best-selling guide to social media for leaders, The $4 Billion Dollar Tweet. He shares his insights on the world of tech and social media in Forbes, Fast Company, and Inc. He also ranks as a global influencer on LinkedIn and Facebook. Follow Holmes to learn about the latest social media trends, tips for business leaders, and get insights on how to create and maintain a positive company culture. If you’re looking to brush up your writing skills, Ann Handley is a good place to start. She’s a digital marketing expert and Wall Street Journal bestselling author of Everybody Writes. She was cited in Forbes as the most influential women in social media and made the list of 20 women bloggers in ForbesWoman. 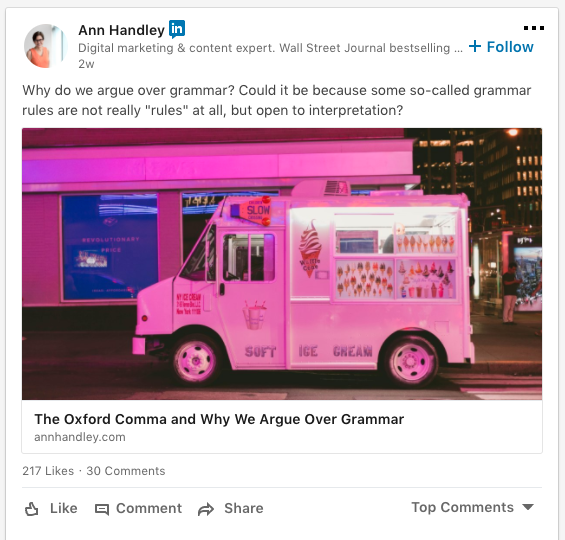 On LinkedIn Handley shares her marketing expertise along with her latest thoughts about the world of writing. If you like reading about the latest Oxford comma debate or want helpful marketing tips, follow Handley. As a leader in the digital media creation space, Adobe has a lot of knowledge to pass on to creatives and brands. On LinkedIn Adobe shares the latest trends happening in the digital space, along with tips from experts on how to improve your strategies. Follow Adobe if you want to create better digital experiences for your brand. Follow these LinkedIn accounts to stay educated and curious. You’ll open your mind to new experiences, get insights on your industry, and make your work life more enjoyable.